The Dodge Charger SRT Hellcat owned, driven and tuned by Zdung Ho is the quickest blower-only example of the supercharged super-sedan, running a 9.21 at nearly 150 miles per hour with more boost, more fuel, some weight reduction and great engine tune. Last November, we brought you the news of a Hellcat Charger covering the quarter mile in just 9.04 seconds, making it the quickest of the factory-supercharged Dodge sedans in the world. That record-setting time was achieved with a host of upgrades that includes nitrous oxide. Today, we bring you a look at the quickest Hellcat Charger in the world to rocket down the quarter mile without nitrous. 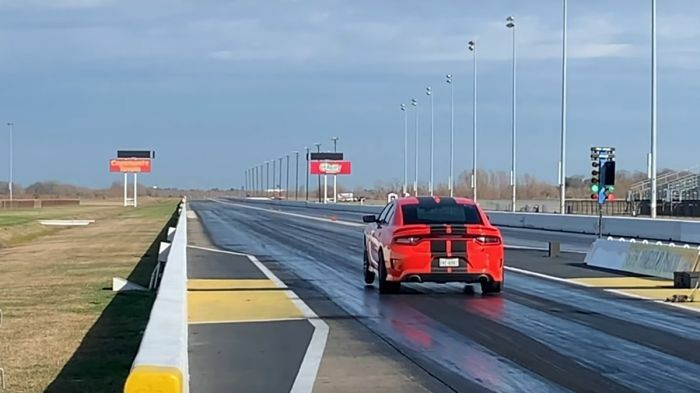 The Hellcat Charger in the video below is owned, driven and tuned by Zdung Ho and in the video, this monstrous sedan stormed down the track in just 9.218 seconds at 149.27 miles per hour, comfortably setting the “blower-only” record for the Dodge super-sedan. The Dodge Charger SRT Hellcat in the video below has all-stock engine internals. The block, bottom end, cylinder heads and camshaft are all original and the only time that the 6.2-liter Hemi was opened up was when the supercharger was removed to install the upper pulley. It also has a stock 8-speed automatic transmission, the stock 2.62 rear gearset and the stock axles, with the only aftermarket component in the driveline being the Driveshaft Shop driveshaft. The key upgrades begin under the hood, where Zdung added a 2.5-inch Metco upper pulley and a new lower pulley for more boost. Helping to keep the compressed air as cool as possible is a Killer Chiller system with an auxiliary coolant tank and a Legmaker cold air intake helps to provide all of the air that the blower needs. With all of the extra boost, Zdung added an array of fuel system upgrades, including ID1300 fuel injectors, Injected Engineering’s Gasohol Dual Pump upgrade kit and a Kenne Bell Boost-A-Pump, with the system tuned to run on ethanol blend. The record run was made on E90, for those wondering. After adding lots of power, Zdung began cutting weight, starting with the interior. The passenger seat, rear seat and the contents of the trunk have been removed, as has the windshield wiper system, the rear section of the exhaust and the sway bar. The factory rear brakes have been replaced with a smaller set of stoppers that make room for the 15-inch rear wheel conversion and to help those big Bogart wheels put the power to the ground, a set of springs from a new Demon have been added for proper weight transfer. In the video below, you can watch Zdung Ho’s Charger clean off the tires, leave the starting line with the front tires off of the ground and storm down the track quickly enough to set a world record. With a 1.375 60-foot time, this supercharged Dodge sedan covers the quarter mile in just 9.218 seconds at 149.27 miles per hour. Other than the “Omega” car that ran a 9.04 with nitrous oxide, no other Hellcat Charger in the world has run the quarter mile as quickly as the muscle sedan shown here.